As you all know, I am an avid runner….and now that I’m a mother, I am an avid STROLLER runner. I take the twins with me on runs multiples times per week. In fact, since buying our Bob Revolution Pro Dualie 4 months ago the twins and I have logged over 200 stroller miles together. Pretty awesome right? I get lots of questions about stroller running. People ask me all the time, “How do you run with the stroller? Is it hard?”; “Do you like it?”; “What do the babies do while you run?”; “How do you run without pumping your arms?”; “Did it take a while to get used to it?”…. the list goes on. So I thought I’d share some insight I’ve gained about stroller running to help folks understand how I make it happen — but also provide some tips for getting started for anyone who is considering hitting the road with their little one (or ones!). Part 1: Happy Baby, Happy Run – tips and tricks for keeping your passengers happy while on the roll! Part 3: Runnin’ and Rollin’ – how to prevent injury, tips for getting into “stroller shape”, plus thoughts on the best places to run with your stroller. Just a quick disclaimer – this is not a sponsored post, nor am I, in any way, affiliated with any of the mentioned companies or websites. All opinions and insights are my own. 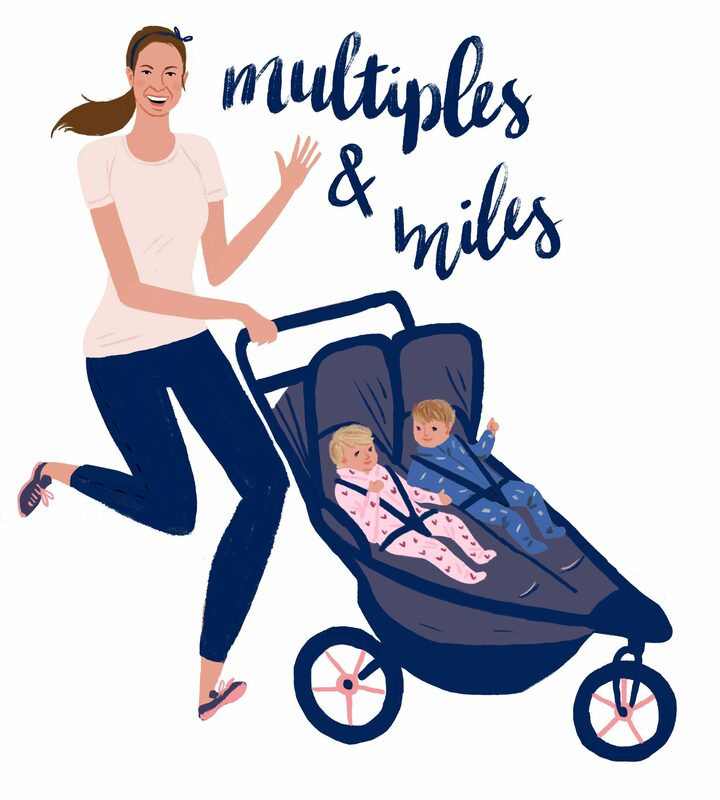 I am just hoping to help inform and possibly recruit some more stroller running moms and dads out there! Safety First! First and foremost, be sure to check with your pediatrician and get the go-ahead for stroller running. Most doctors recommend you wait until your baby is at least 6 months old before taking them out for a spin in the jogging stroller. You may be able to bring that age down if you run with the baby in a car seat using a car seat adapter, but still, it’s best to talk to your doctor first and make sure your baby’s neck muscles are strong enough. Pack…..everything. I’m sorry but going out for a run with the stroller means the days of leaving for with just your phone and keys are gone. When I go out for a stroller run I basically pack half my house. Kidding…sort of. I do leave prepared for everything though. Bottles, diaper bag, sippy cups, toys, pacifiers, blankets, snacks. If you THINK you’ll need it, bring it. Thankfully most strollers have ample storage baskets, don’t be afraid to use it! When you look at the pile of supplies you may feel worried about the added weight to the stroller, but it won’t add up to much. And, whatever it does add, I promise – it will be worth it. There’s nothing worse than running your last 3 miles to the soundtrack of a screaming baby because you forgot the pacifier.If you’re running with older kiddos, you may want to attach any items you take along – like toys, bottles, pacifiers, etc – to the stroller with straps like the Nuby Keepeez Bottle/Toy Strap. That way you won’t have to stop to pick up any items tossed overboard along the way! Bundle up baby! Just because you’re sweating doesn’t mean the same for your kiddo! Make sure to bundle up baby just like you would for any other outing. I sometimes even do double blankets for the twins if it’s chilly. For windy or wet days, I cover them up with the BOB Weather Shield – or as I call it, “The Bubble”. It’s great for peace of mind knowing the twins are snug and warm even if I’m getting blasted in the face with wind and/or rain. Running in the rain with “The Bubble”. The babies are snug and dry! Me not so much…. Timing is key. Just like everything else in your life, baby’s schedule sets the tone. If you’re out to dinner and baby is unhappy, there’s little chance you’re going to have a pleasant meal. Stroller running is the same. So try to work your stroller run into the daily routine at a time when you know your passenger will be happiest. Totally depends on the little one – and it may take some trial and error! I tend to aim for morning naptime – I run best earlier in the day, they’re fed and happy and then they snooze for most of the ride. I get a workout in, they get a nap. Win win for all of us. I look forward to sharing part 2 and part 3 with you of this Stroller 101 Series. In the meantime, I want to hear from you! Are you thinking about getting running stroller? Do you have any questions before you take the plunge? Do you already have a jogging stroller that you love? Any tips/tricks to help for a successful stroller run? What are your tricks to making stroller runs successful? I think that what you are doing sounds great. I always took my boys out for long walks as the motion made them sleep so it’s got to be a win win for everyone!